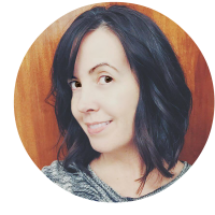 This week's "What-I-Made Wednesday" features even more office decor. One of these days, I'll be done decorating my new office...probably right before we move! This WIMW also combines two Pinterest finds into one. 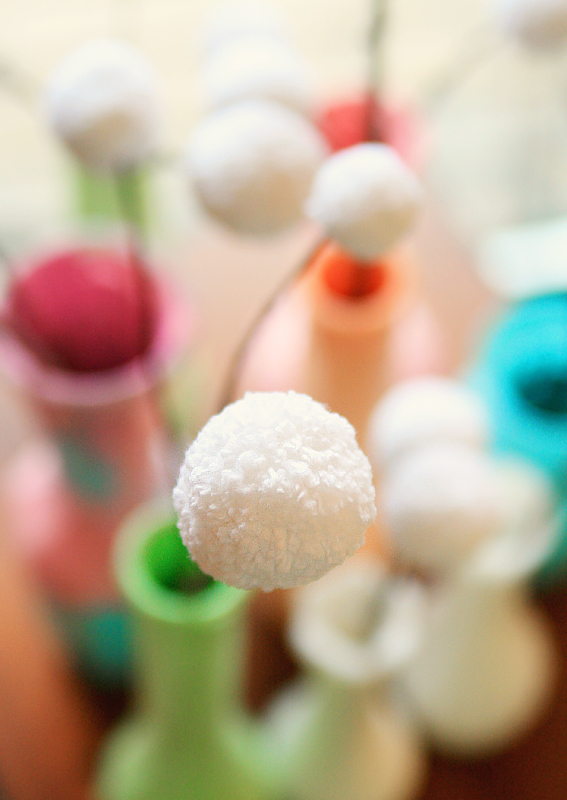 The first are these super cute yarn pom dandelions. The second Pinterest find are these gorgeous painted vases. 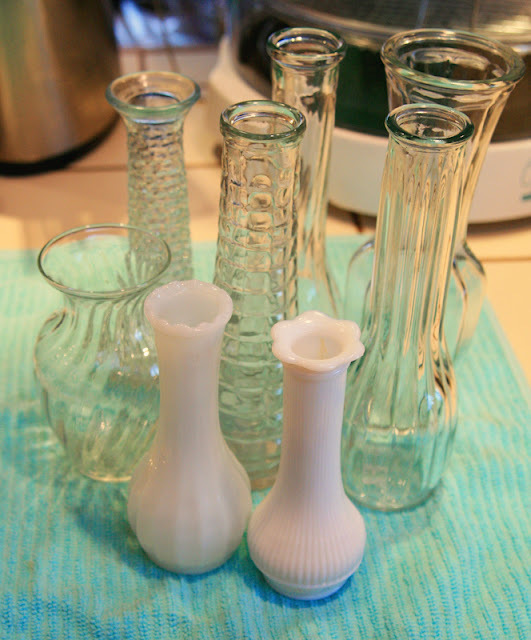 I found a bunch of vases at the thrift store ranging from .25 cents to $1 buck. 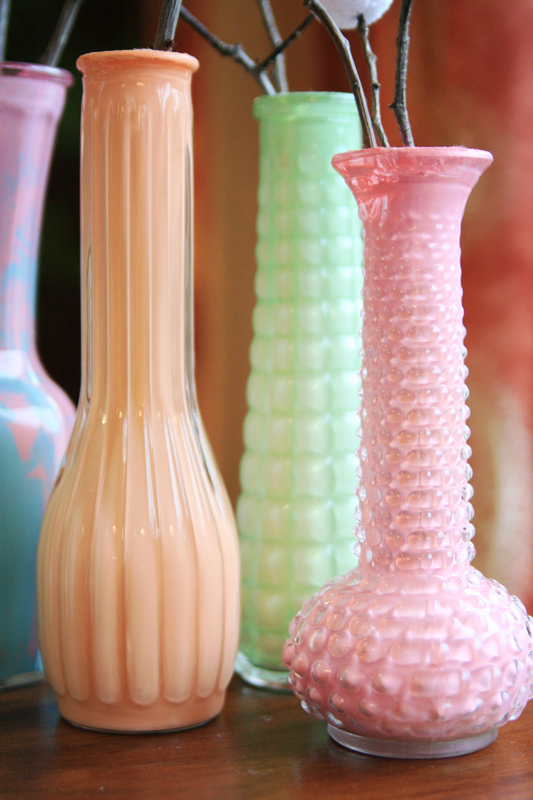 I also chose to mix blue + pink for the largest vase. I love the cotton candy look! I made the white dandelions super tight. But then I made larger, fluffier versions with a multi-colored yarn. Have you tried either of these projects, yet? Don't forget, you can share what you've made recently by posting a pic/link on my Facebook page for What I Made Wednesday. 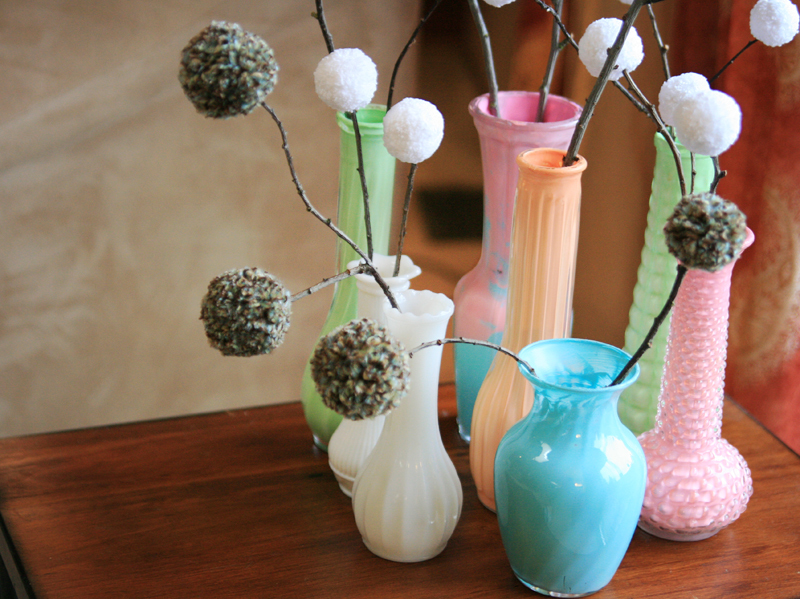 The vases are lovely..such great colors! I loved this idea! I'm thinking of betting some vases, panting them like this, and then using a "book" shelf tutorial I pinned recently as some focal art in our living room. so cute! this may be a dumb question, but did you use a paint brush? or...? How much do you pour in there? thanks so much for letting me know about the link! The peach and mint green are my faves! 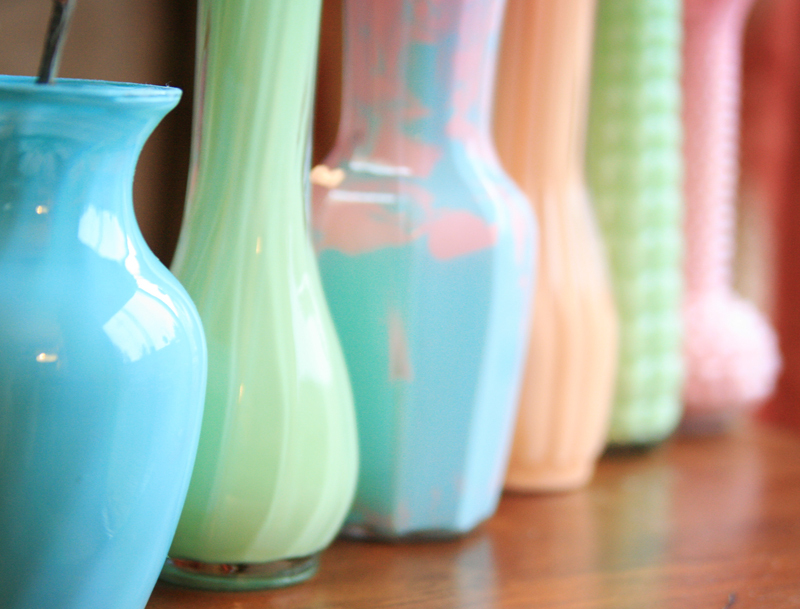 amazing one!i am just curius what kind of paint did you use for vase? OO love these! Glad you posted them to the etsy team. 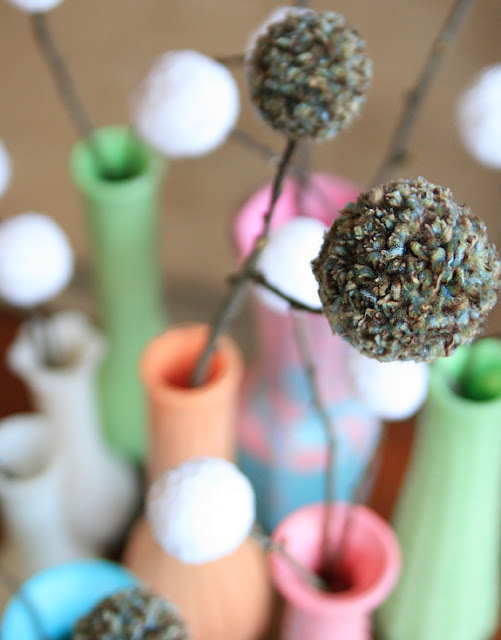 I loved your pictures and the colors you used so I used your post as my "craft of the day" on my facebook page. Great job! I did this project, but with mason jars. I did three different kinds. The first was just straight paint. The second was a little tiny bit of paint mixed with modge podge. The third was modge podge + food coloring to give it a clear sea glass effect. They all turned out lovely. But, just a note to everyone doing this, DO NOT PUT WATER IN THE VASE!!! It caused my paint to peel and crack. The ones with modge podge changed color and the paint cracked a bit, but once I removed the water they were salvagable. The one with straight paint is a write off. These are wonderful. And a great tip for our budgeting brides. Thanks for sharing. Thank you! Your jar looks great! What type of paint is best to use ?? Basically you want to clean and prep the case. Then use a paintbrush to paint the inside. 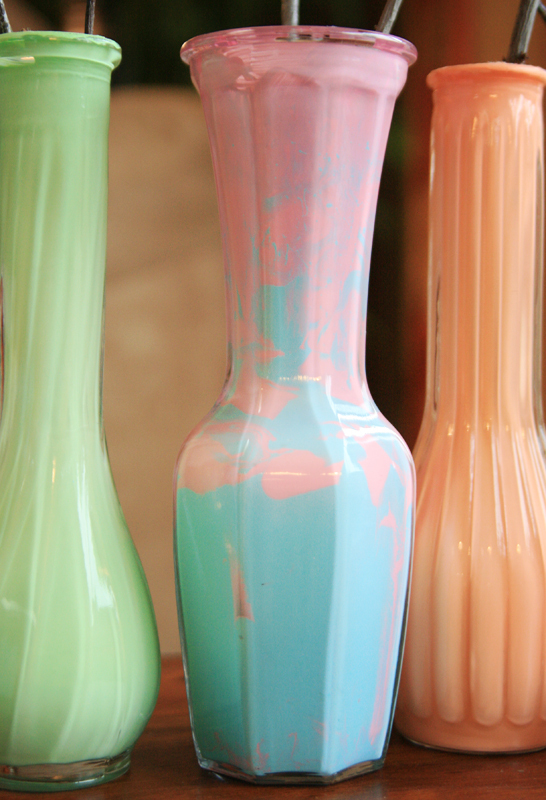 For the really skinny vases, I had to pour in the paint and swirl it around. The drying takes quite a while depending on how well the paint covers.